$2 off Coupon on Scott Naturals | A Savings WOW! If your household is anything like mine, then you go through a lot of rolls of toilet paper in a given week. When it comes to keeping your bathroom tidy, it can be a hassle and a drag. Next thing you know when you’re emptying the trash, you have accumulated countless rolls left over from your toilet paper. Whether you throw the tubes away or recycle them, there is a better solution to improve our environment. Scott Naturals has created an exciting new product that can give all of our lifestyles an eco-friendly boost. Scott Naturals Tube-Free bath tissue functions exactly like your standard toilet paper on the roll, but doesn’t have the left over tube that gets thrown in the trash. Using Scott Naturals Tube-Free bath tissue reduces waste and is better for the environment. Just when you thought this new product couldn’t get any better, it does. The Tube-Free bath tissue rolls the same on the holder as your standard toilet paper with the same great value and quality! Now you are probably asking yourself where you can purchase this great new product. 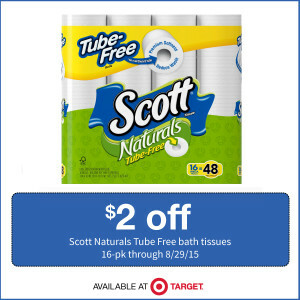 Receive $2 off on Scott Naturals Tube-Free bath tissues 16-pk instantly at Target.com. Right now, Scott Tube Free is available in select Target stores in the Northeast Region of the United States. Help out the environment and take advantage on this great deal! Saving the environment one Tube-Free bath tissue at a time.